In my garden I have some mint. My mum gave it to me as a cutting from the mint in her garden, which came from the mint at our old family home. Subsequently, cuttings and root clumps have been given to various friends and relatives. Last year, mum’s plant went into a decline, so this year a clump will be returned to her garden. Also last year my sister moved house and so another clump went to her for her new garden. I love the fact that this particular plant has a family history and that it has been valued by so many of us. 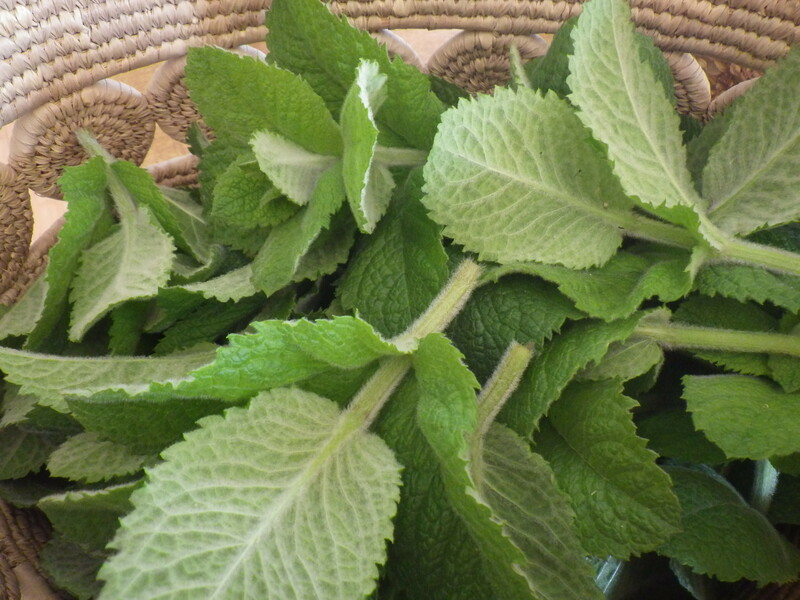 It’s not the usual peppermint that folks use in cooking, but a variety of apple mint, although one that has a stronger flavour than many I have encountered. It makes a very good herbal infusion (I refuse to call it tea) when fresh and is our mint of choice for making mint sauce to serve with lamb and mutton. In addition, I like to grow it amongst my soft fruit to suppress dock and nettle growth and attract insects when it flowers. There are also suggestions that growing aromatic herbs with fruit can repel insect pests – I’m not sure that we really suffer from pests on the raspberry, but perhaps it helps keep sawfly off the gooseberries. Anyway, I don’t think this sort of companion planting does any harm and I like the visual effect. 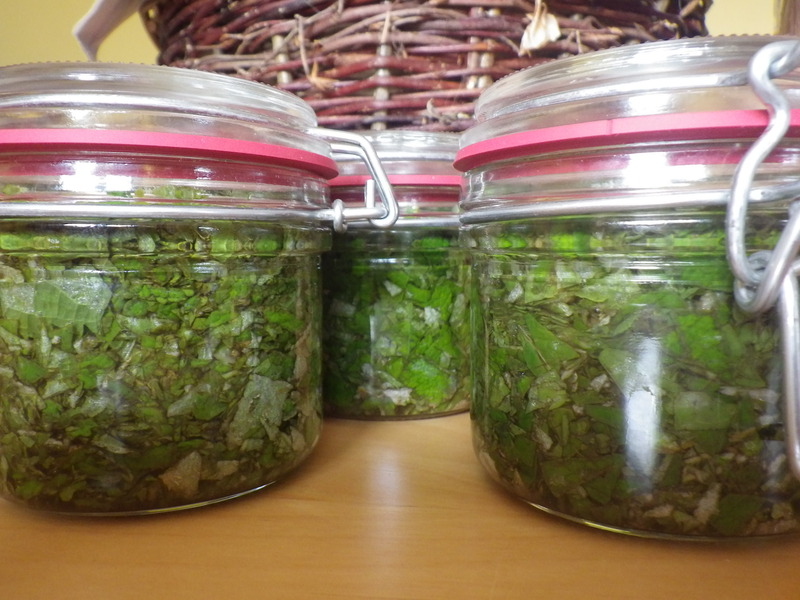 I ran out of mint sauce not long ago, so yesterday morning I made three more jars. It’s very easy, just chopped mint leaves in vinegar. The choice of vinegar has an effect on the flavour. When I was a child, we made it using malt vinegar and we “chopped” the leaves by passing them through a herb mill, which pulverises the leaves, squeezing some of the juice out. 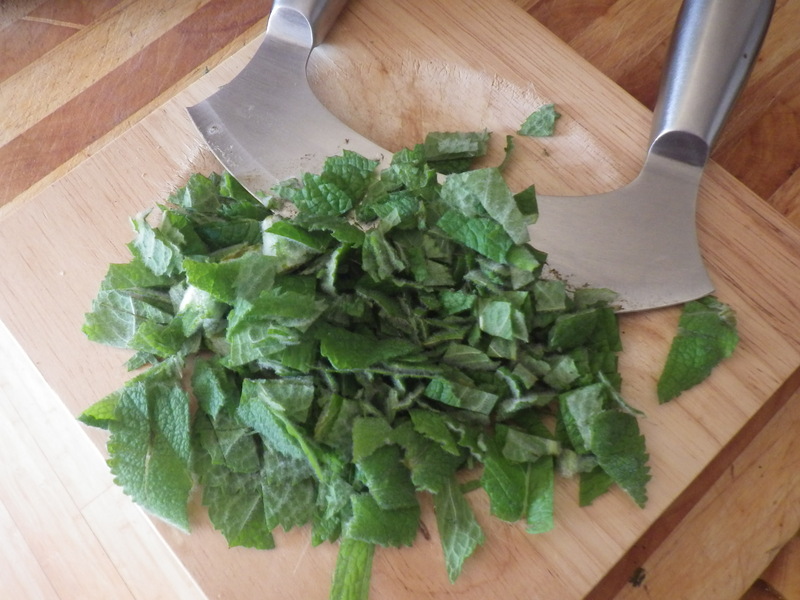 I do own a herb mill, but these days I prefer to chop my mint by hand using a mezzaluna – it’s a bit more time-consuming, but I like the texture and the blade is much easier to wash than the fiddly herb mill! Neither do I use malt vinegar, but instead prefer the more subtle flavour of cider vinegar. Because of the vinegar fumes, you shouldn’t store mint sauce in jars with metal lids, so I have put mine in little preserving jars with glass lids this year. This is my first foray into preserving this year, but I know that there will be much more to come. Will you share my dry space? 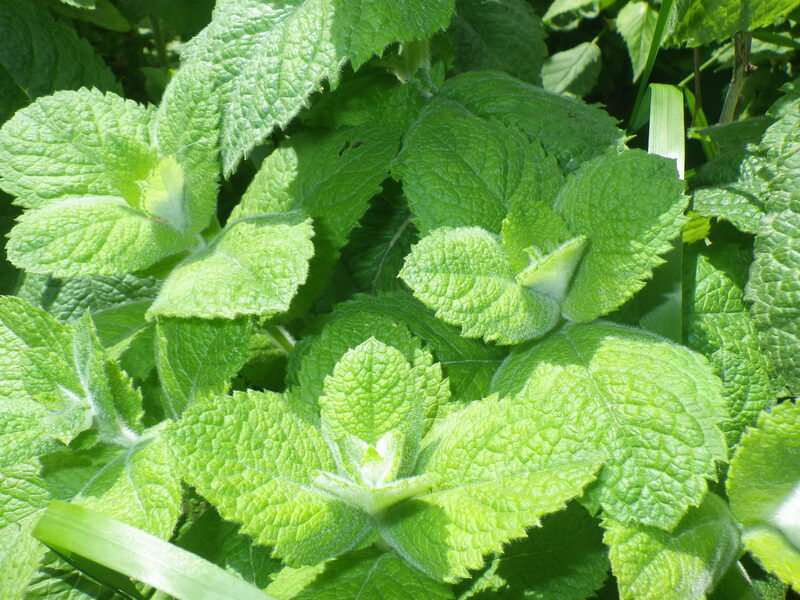 We had a similar situation with the lemon balm (Melissa officinalis) from our family home. I had a big pot of it on my balcony in London, and sadly it had to be rehomed when I emigrated. Now it’s giving my brother a hard time in his West Sussex garden – he let the roots escape from the bottom of the pot! Mint doesn’t do terribly well here in the tropics – I think maybe it needs cooler weather to develop the sharper notes in the aromatics, but I have a nice little potted spearmint in the coolest spot on the patio. I want some chocolate mint and apple mint to go with my pineapple sage! I love that your mint has such a story! We grow mint, too, but mostly just so my husband can make mint juleps–maybe that’s an American thing? I have heard of mint julep, but have no idea what one is! Nothing but good bourbon, a little sugar syrup, muddled mint, and ice. Pretty yummy but potent! We have done the same with snowdrops. Lovely to share plant goodness. I do like a plant that can be shared! After you put your mint and vinegar in the jar, does it have to be refrigerated? How do you store it and how long will it last? I have no idea what you do with mint sauce but it looks interesting. I always liked a sprig of mint in my iced tea in the summer. I have lemon mint growing in my yard that was here when I arrived. No idea what to do with it but it smells wonderful. Lovely! There’s some Vietnamese mint floating around Tasmania that started with a plant I grew from cut mint I purchased at an Asian grocers when I first moved down there. The thought that so many have gone on to grow and share it makes me smile.